Roizman’s five-floor proposal for Jenkintown isn’t perfect, but it will enhance our downtown in a way that a drive-through window never could. Among the lesser controversies swirling about the Borough Hall of Fun is the five-story apartment building for seniors proposed by Roizman Development to replace the Salem Baptist Church. This project also requires (and got) zoning code variances for height and parking. As expected, some in town and especially those that live near the project aren’t happy. Opposition to the variances sought by Summerwood and their Taco Bell proposal has merit, because the project would conspicuously degrade the surrounding environs and contradict the established desire of the community to preserve and extend the traditional design of the Borough’s central business district. A variance for Summerwood effectively plants the stake for sprawl north of Cherry Street and probably further into the core. 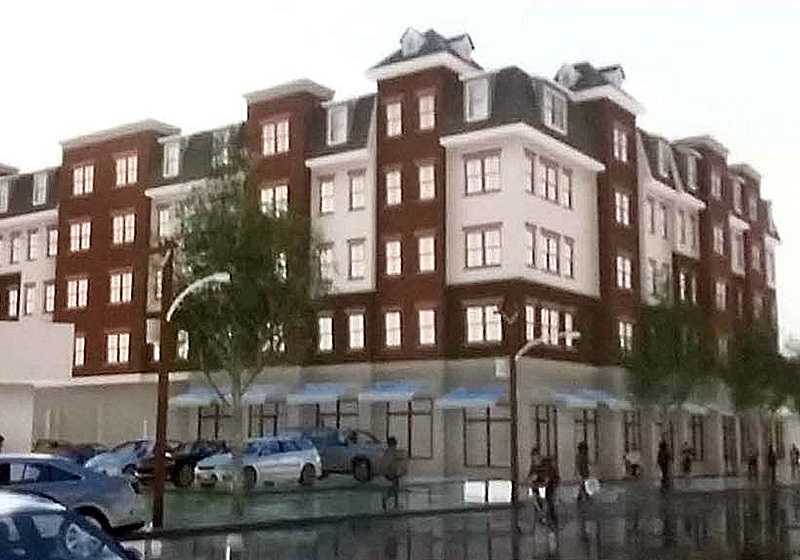 Instead of multi-story mixed use, Jenkintown will get parking moats engulfing tiny buildings. Roizman’s project, though hardly an ideal concept for that location, would enhance the urban nature of Jenkintown’s center — mainly because it will bring more residents into it. With that in mind, discarding parking minimums (which shouldn’t exist in any case) and height requirements make sense. Both factors which are conducive to a thriving walkable in the central core should be determined by the market, not by fiat. If people want to come live here, we should encourage that. While the residents on Cedar Street have understandable concerns about elderly apartment dwellers peering down into their back yards, a code-compliant four-story building would make them just as uneasy. The four-story office buildings behind our house provide a great view of our bathroom, especially in the winter when the leaves are off the trees. We just pull the shades. The space between the houses flanking our property measures only about 20 feet. If we valued privacy over community, we would have moved to a subdivision north of Horsham. We suspect, however, that the parking issue will get most residents in a snit because parking always gets people in a snit. I once attended a hearing where a resident stood up and said, “We have to preserve that parking space, because we may need it in twenty years.” This was 15 years ago, and despite the lack of parking, rents, commercial activity, and property values in that Boston-area community have skyrocketed. The communities and downtowns that Jenkintonians most often point to as models for our own future have a serious shortage of public parking. Despite this, those places have high occupancy rates and busy sidewalks. Conversely, towns with an abundance of parking have… lots of parking, and little else to show for it. The expense of providing all that public parking or allowing too much private parking typically produces deficits, as it does in Jenkintown. We guardedly welcome Roizman’s development into the community. We would rather see more space devoted to commercial activity than currently proposed, but the building design does fit in with Jenkintown’s small-town, urbanist character.